... You are lifesavers, thank you so much for the assistance, you did an excellent job of customer service. Thanks Randy D.
Dear support guys, My One Click and DVD43 is up and running thanks to your great customer service. I can not say the same for the service I get back in the States most of the time. I have enjoyed your software for years. Keep it coming. Have a happy new year, Jack. Thanks again for your complete answer. You and Eliot are among the very few support people who actually read and understand questions and have the knowledge to thoroughly answer them. You have my appreciation and respect for that! HI. Thanks for the prompt reply. Excellent customer service. What I expected. Great. Thanks Karen, You represent a great company! Thank you very much for helping me with this. While it may seem like a simple thing for you, the customer service you gave me was terrific and I truly appreciate how my issue was resolved. Great product and great support team!! 1. It works and I don't have to put my Rocket Scientist persona to the test. 2. It is updated regularly without changing the interface or adding things most of us don't need. Your programmers came up with a great product and stuck to it. Thanks! Thank you for the quick response. You are a class company. Thanks again. Just a quick thank-you note from a pleased customer. Speed of service and quality thereof outstanding. Many thanks! THIS is why I love to get your products...IF they are buggy, at any time, your technical support is quick to reply and help. This was a VERY well-written letter. I know you took your time to do it and I appreciate that because I'm converting DVD's of my mother's memories of 81 years of life. Your program helps immeasurably when it's working right. Now that is what I call customer service. Excellent. Thanks a million. Thanks very much for this extremely high level of customer service. You guys are great. Working now. Thank you again. Thank you for your super support. You're #1 in my book, again thank you! I want to thank you for helping me out, I really appreciate it. Sorry I had to keep bugging you but I'm happy to say "it's fixed!!" Thank you for your support and responding so quickly to my e-mails. Thank you, you guys do a great job! Thank you, great customer service as always. You've got a great product and that's why I've used both versions for so many years. I hope your engineers keep up the good work! BTW, I think the 1Click DVD Copy Pro is pretty awesome. Thanks for all your help & follow-up. It has been great & yes all is working well now. Your quick responses & updates were fabulous. Thanks again – I’m a happy man. BTW if you would like a reference for the Internet to advise that your product works well with ALL Windows – let me know the format & it's done. Thanks for all the help. You have "the Best #1" Help Center: courteous, eager to assist, rapid response time, never treat any question as mundane or ridiculous, and are very patient. Thank you, both programs now up and running. Thanks for providing such a fast and great service. You have always had great customer service over the years! Thanks Team! You are the best. It worked. Whenever I have a problem you have the solution. Thanks again. Man this is what I'm talking about..... good timing and response... thank you..
All I can say is Perfecto. I had no problem copying the movie and it played just beautifully. Thank you. Thanks! You guys are always so helpful. Thanks a million, you guys are the best. All good now I really do appreciate your help from the other side of the world. Great customer service. Thank you very much for your time and effort, excellent customer service. Thank you so much. You are very helpful. A great product and great support ... it's rare to have both, but LGSI does. Thanks again! Thank you very, very much. I am sorry for any confusion in the first place, and I appreciate your good business practice and gesture. Have a super day! THANK YOU! You have renewed my faith in the internet. Once again your customer service is second to none. THANK YOU for the PRO upgrade and the quick response on my computer problem. I'm a loyal customer and will continue to use and promote your product. I appreciate all your time, effort and kindness to resolve this. Thank you. Yeeeeeeaaaaaaaaaaaaa!!!!!! You guys ROCK!! Thanks. OK. This is a great program, and I have already recommended it to my son. Thanks for your patience. Thank you for your prompt response. You have a good program and good customer service. Thanks. Thank you for your understanding, help, and commitment to customer service. It is appreciated. Thanks so much, worked fine. Great tech support! I really appreciate your technical support and excellent customer service! Thanks for all your Help!!!! 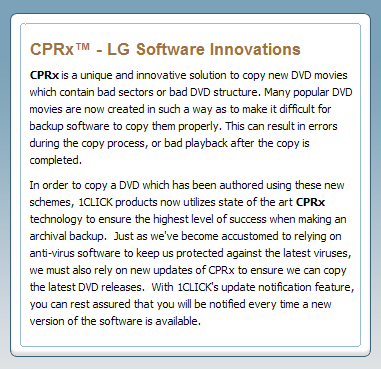 I am a long time customer and have been using 1Click DVD Copy Pro for years and am very happy and found your technical support to be second to none, thank you very much for that. Thanks for the quick responses from all of you. I appreciate it. Happy New Year! You guys are great. I love your software , its easy to use and your support team is well what can I say. Merry Christmas! Thank you very much for your fast response. 1 Click is a great software!!!!!!!!!!! Have a nice day. Awesome Jimmy! Thank you so much. And less than a 24 hour response time...EXCELLENT customer service. I continue to be so impressed with you guys! Thanks so much! Thanks guys love the program and the service. You do good work! Obviously, I like your product! Keep on keeping on... All the best. Finally.....Hey thank you all for the great aupport and patience...That's why I stay with you folks.....You have a good product and I will continue to renew... Thank you. Thanks for the speedy response, Jimmy. Great product and great service. That's why I stick with LG! I want to commend you and LG for always returning emails, answering questions and rectifying problems in a timely manner. Thank you very much. I have been using "One Click" now for many years and always install the updates you send. There has only been one problem in all those years and you fixed it quickly. Thanks for your help. I would be lost without it. You are the best. Thank you so very much for you prompt and efficient support. Your products and customer service has always been an A+. Thanks again. Thank you guys for for your perseverance ! And you don't know how frustrating it was for me for the past few weeks. Now it's all clear and bright. Many thanks again. Absolutely perfect copy! Your software is worth every penny! (so far ;>)Â ). Thanks. Thank you, Thank you!! All seems to be working!! Thanks for the great communication and the fix. Thanks so much for the change on my application. It is now working like a charm. Great doing business with you and love the 1 click copy pro. Thanks again. Thank you, THANK YOU! and Thank you, it works. Great job, A+++++again I like to say THANK YOU! Thank you VERY much, you have great customer support !! Absolutely perfect copy! Your software is worth every penny! (so far ;>) ). Thanks. Thank you so much for your prompt reply. I just want to tell you how satisfied I have always been with your product, and now I see that the Support is also Excellent. Thanks again. I thank you for making my life easier. It was because of my own mistake that I spent hours trying to solve an impossible problem that happens when you install the wrong version. As much as I enjoy all the features of 1Click Pro I love the support even more. The response was fast, friendly and courteous. In just a few minutes all my problems were gone. Excellent! Thanks my program is working fine. I love the program and will be staying with you. Thanks again. You guys are awesome thanks very much for your very quick response and for addressing my problem. thanks again. I have had your programs for many years and think they are the best. Your customer support has always been outstanding to, thank you for that since this has become the exception the past few years. Thank You. Thank you very much. Your support is fantastic. You "guys and gals" are great!! You proviced great support in a very responsive manner to solve my problem. All seems to work okay now. For "not very computer savvy" people like me it's great to be able to get answers to problems. Many thanks for your great help. wow! ...problem solved. thank you. awesome program, awesome help. Thanks!! Thank you very much for your much needed help. This is the BEST support team on the net! I would recommend your company if they want a good DVD burner program. Keep up the good work. Over the years, the customer service from your company has been fast, accurate and amazing. Thank you for your rapid response. I knew you guys "and/or gals" at LG Software were good! When friends ask I always highly recommend you. Thanks again! Thanks for your fast response! I must say, LG Software is really a great company and the support is outstanding. I want to thank you all for the tremendous support and help you've been as I worked through my small problem. Your immediate response was absolutely beyond belief. Never have I had the type of service you provided from any other firm, either on-line or in retail stores. You are to be congratulated on a job so very well done. Worked like a charm. Thank you so much for the fast responce. Best tech-support I have ever dealt with. Problem solved! You folks do provide great service, I hope you can keep it up. I need to buy a Blu-Ray 3D writer now, and then use your program for that. Thanks again. You are always so helpful and quick to respond. That's why I keep buying the products....Your Support Is Great. Thanks. All is working perfectly now. And always nice working with top-notch people and software. Everything is working great and I think the program is fabulous (and faster than what I was using before). Thanks Again. Not sure if that counts against my load, but for excellent service that this program provides it is well worth the nominal cost. Thanks! Thank you for all of your help - - my 1Click DVD is up & running again! I've never received the kind of support you provided from any other software (or hardware!) company out there. I want to take this opportunity to thank you and the staff (company) for your excellent software product and most of all, on those rare occasions, the timely and helpful technical support. I only wish that others I have to deal with in various areas of life were as conscientious and timely as you. You're software is the best. I have been using it for years. And love it. Thank you so much for your assistance. I think your product is terrific and your support outstanding. Thank you and the software engineers at 1CLICK. Your "Fix" corrected my problem. Your assistance is always fast, efficient and corrects the problems. Thanks again! Your responses and fixes are why I remain a member of your 1CLICK service. 3) you give prompt and effective customer service: you succeed in resolving our difficulties. You are excellent. Am real glad to be with 1ClickDVD. I might mention that I love this program. Very easy to use and quick! Thank you. Thank you very much for your assistance and understanding. If I can leave positive feedback anywhere concerning lgsoftware customer support please let me know. Thank you so much for your assistance with this problem. I wanted to tell you that all works fine in the new computer as your instructions were very clear and very helpful! Your customer service is exceptional! Over the past few years I’ve had the opportunity to use a number of different programs for converting DVD movies to my IPod. I’ve tried the trial version of your software and it’s not even close, you guys have the best program I’ve used to date. The program is very user friendly and quick as well. It works terrific with DVD43. I will be purchasing this for sure and will be looking at the one for converting DVD movies to my computer as well. Thank you for putting out a great product! Your product is great!!!!! As you records show I am a repeat customer... thanks again for all the help. Your products are fantastic and I just want to say thank you. They work perfectly and are easy to use. Great job! Keep up the good work with the program. '1CLICK DVD COPY' is one of my top 10 programs I use & would suggest to anyone to use. A great program at a reasonable price. I must say this is the most professional company I have ever come across, brilliant customer service, quick responses. Excellent. Please pass this on for me. LG Software Innovations is a great vendor. I am more than pleased with the service and response time I received from you, Phillipe and Norm. If LG needs a satisfied customer endorsement, I'm here. Thank you. you guys rock thats why I tell all my friends about how good and easy your product is to use. now i can tell them how great the support and customer service is as well. Bless you. You will have a customer for this and your other products for a very long time!! Excellent service and timely response. Please pass along my compliments. Thank you so much for your prompt reply and information. LG Software Innovations gets my vote as having superb customer service. You guys always come thru. Thank you very much... one very satisfied and happy customer. Your soft incredible, its worth every single penny. It does EXACTLY what you say it does. Its even easier than I thought. Way to go ! !